* Limited Time Sale Price: $99.00! 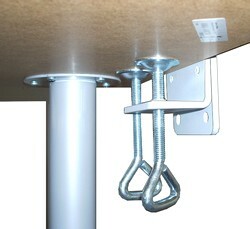 The DFL17-CL is a great way to save space on your desk or table by quickly clamping a monitor stand on the table's edge. 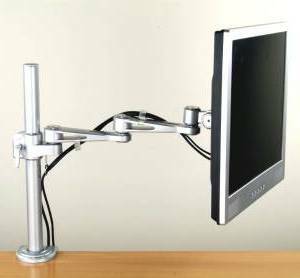 In addition, the articulating arm is great to find the best facing angle for your monitor. 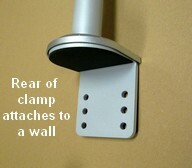 You can pull it out up to 17" from the pole and then push it back towards the pole or just swing it out of the way. You can also rotate the arm 360 degrees, so it can actually face anywhere. If you have a touchscreen monitor, you can make the monitor face upwards and use the screen in stand up mode. Thre arm is also height adjustable all along the pole. 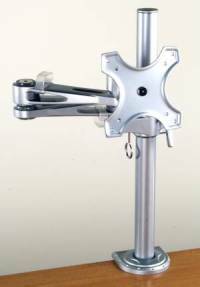 - Clamp opens up to 3"
- Articulated Arm extends from 4.5" to 17"
- Monitor tilts, swivels, rotates AND turns all around the pole, facing anywhere.